Ireland will tour Australia next year in the first ever three-Test series played between the teams. The matches will kick off in Brisbane on 9 June, followed by Melbourne a week later and then Sydney on June 23. Ireland won their two most-recent encounters with the Wallabies, in Dublin in 2014 and 2016, but have not played a Test in Australia since 2010. It will be a formidable task for the Irish, with Australia not having lost at home to them since 1979. "The Irish diaspora are renowned for supporting the Irish team when they visit their new homes so we know there will be a party atmosphere to match the world class rugby," said Irish Rugby Football Union chief executive Philip Browne. The announcement was made in Sydney as Irish President Michael Higgins visited the ARU headquarters during a state visit down under. 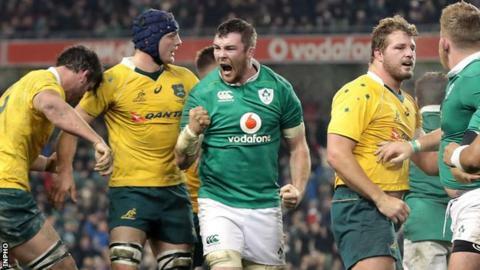 Ireland have played two Tests on tour against the Wallabies on four previous occasions (1979, 1994, 1999 and 2003), but never has the Lansdowne Cup been contested over three matches. "The rivalry between the two nations has grown enormously in recent years with some memorable encounters," said Australian Rugby Union chief Bill Pulver. "With a huge number of Irish expats living in Australia, Ireland will enjoy strong support."